Pick a Spa or Hot Tub! Aquarius Pool & Patio can help you select the perfect hot tub for relaxation and comfort. We offer complete services and repairs for all makes of spas and hot tubs. We are a “complete” spa and hot tub store in Williamsport, PA, offering spa water testing, spa chemicals, spa accessories and patio furniture. Aquarius Pool & Patio in Williamsport offers HotSpring brand spas, which offer great designs to fit your family size, personal style, and busy schedule. 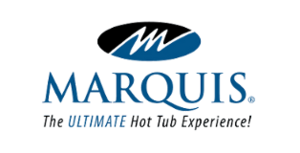 Marquis portable hot tubs are designed to provide you with The Ultimate Hot Tub Experience! Each spa features advanced hydrotherapy and powerful performance. Protecting your hot tub or spa with an efficient cover provides increased cost savings in the long run. We all know that heat rises, so a quality cover will provide lower water heating costs. Over time, spa covers become worn and many become heavy as they soak up moisture. Replacing a spa cover in this condition will increase the efficiency of your unit and make it easier to take on and off. There are often many options available to finance your spa. We’ve partnered with Lightstream to offer competitive financing for your spa. Compare them to your current provider and go with the one you feel most comfortable with. CLICK HERE TO APPLY!